I am writing this from my living room floor, sitting ever so close to the fireplace. It is not even 5pm and it is already reaching dusk. Sadly, it has looked like dusk since sunrise this morning. Winter in Cleveland is something one has to get used to. Beyond the snow accumulation, the amount of overcast days is extraordinary. 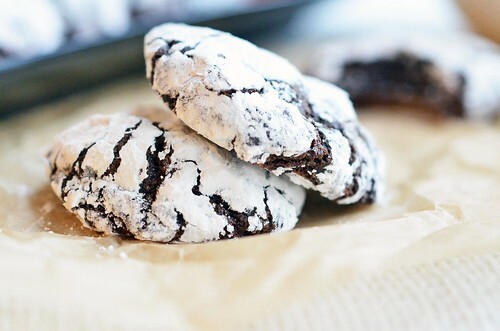 I am still wearing my red apron dusted with flour and powdered sugar, sipping a hot cup of black tea. A playlist of Adele and The Black Keys is filling the otherwise quiet house. Stanley is sprawled out next to me. We are both warming ourselves by the fireplace. If he could speak English, he would probably ask me to stop being cheap and turn the heat up. I can not seem to break myself of this money saving habit I picked up while in college. I only ever remember eating these cookies at church functions. Sometimes you would see the cookies before you saw her – she was really short! But that is how church suppers role. A quick glimpse at the food table and you can get a clear idea of who you will be sharing a table with. And vice versa. If you see a certain individual then you know what you will be piling your plate high with. Everyone brings their best dish. The dish most complimented. The dish that was gone by the time you snuck up for seconds. I loved when I saw the maker of homemade noodles, vegetable pizza, custard pie, and deviled eggs. 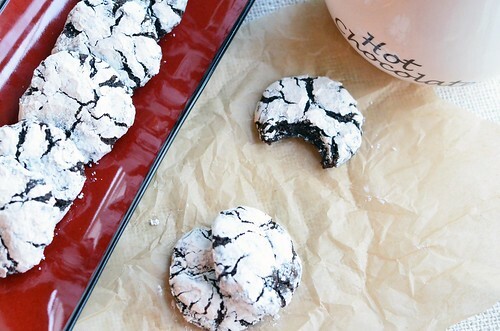 Chocolate crinkle cookies could definataly hold their own at a church supper or at any Christmas party for that matter. 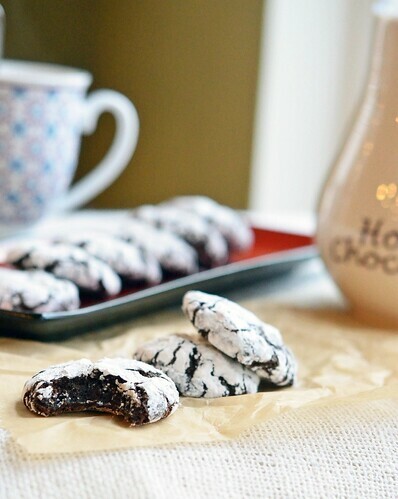 Rich and fudgey, they are quite the indulgence! Perfect for this time of year. I think I will have one or maybe two while I contemplate wrapping presents….or watching another episdoe of Breaking Bad. In a large bowl, combine the cocoa, sugar, and vegetable oil. Mix for 2 to 3 minutes. Add eggs one at a time, incorporating each egg before the addition of the next one. Once the eggs are all mixed in, blend in the vanilla. With mixer on low, slowly mix in the dry ingredients and mix until well incorporated. With a spatula, scrape down sides and bottom of bowl to ensure everything is evenly distributed. Cover with tinfoil or plastic wrap and place in refrigerator for at least 3 hours. Preheat oven to 350ºF and line cookie sheets with parchment paper. 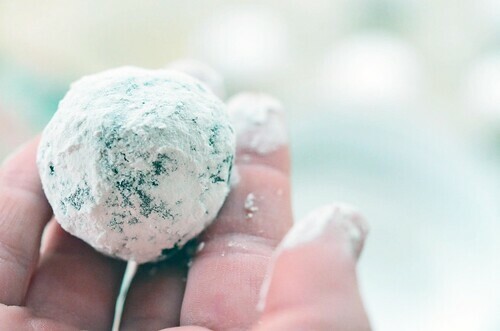 Place confectioner’s sugar in a bowl. 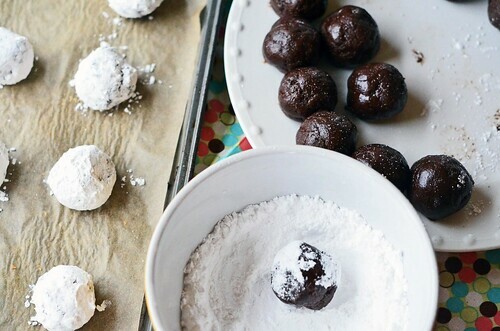 Roll cookie dough into round balls about the size of walnuts and then roll balls in the confectioner’s sugar to coat. Once the balls are completly coated, place them on the prepared cookie sheet about 2 inches apart (slight spreading). Bake in preheated oven for about 10 minutes. Remove from oven and let cool on cookie sheet for about 5 minutes before transferring to cooling rack.